Azure SQL Database is the world’s first intelligent database service that learns and adapts with your application, enabling you to dynamically maximize performance with very little effort on your part. 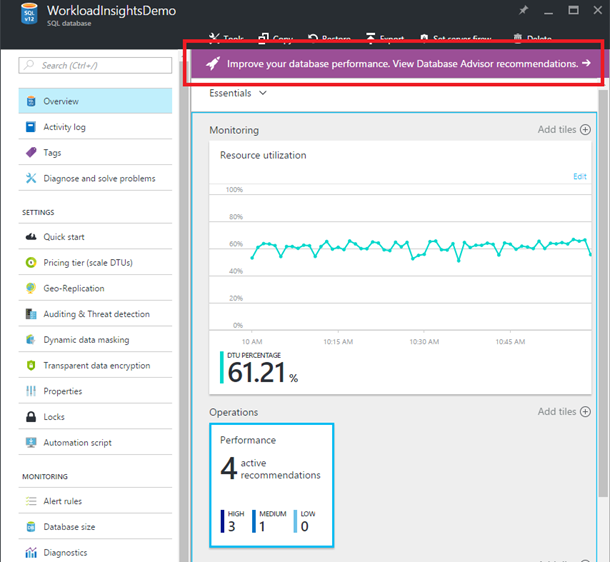 Today we released an exciting update to Azure SQL Database Advisor that greatly reduces the time (from a week to a day) required to produce and implement index tuning recommendations. This brings us one step closer to our vision where developers no longer have to worry about physical database schema management, as the system will self-optimize to provide predictable and optimal performance for every database application. Database Advisor provides custom performance tuning recommendations for your databases using machine learning intelligence. It saves you time, automatically tuning your database performance, so you can focus your energy on building great applications. All these improvements together make automated index tuning an even more attractive choice for managing the performance of your Azure SQL databases. With the new recommendation models and greatly improved underlying automation, Database Advisor will tirelessly work 24/7 to make your database applications run blazing fast at all times. If you’re not using automated tuning yet, we strongly encourage you to give it a try – you’ll be pleasantly surprised with the results, as many of our other customers already were. You can now run your production DB workload in SQL DB for a day, and Database Advisor will help you improve your database performance by providing custom tuning recommendations. You can also opt-in to automated tuning mode where the tuning recommendations will be auto-applied to your database for a complete hands-off tuning experience. Now you can dedicate your energy and attention on building great database applications, while the SQL DB service keeps your databases running and performing great for you. If you’re new to Azure SQL Database, sign up now for a free trial and discover how built-in intelligence of Azure SQL DB make it easier and faster than ever to build amazing database applications. If you’re already using Azure SQL Database, try SQL Database Advisor today and share your feedback with us using the built-in feedback mechanism on the Azure Portal, or in the comments section of this post. We’d love to hear back from you! For more detailed information, check out the SQL Database Advisor online documentation.